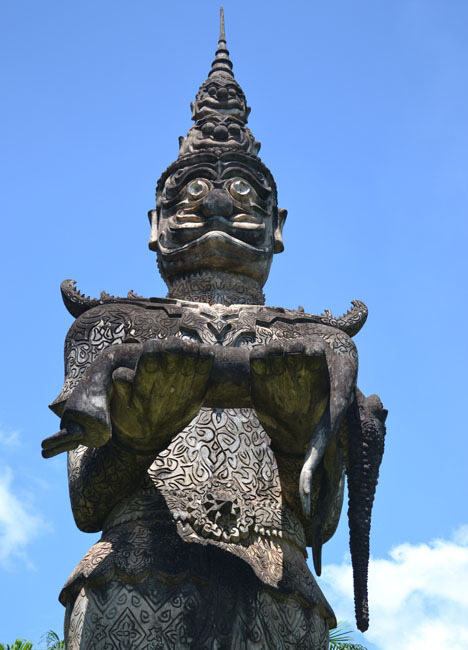 As an independent traveller there were only three realistic options for a Vientiane City tour. Quickly learn public transport, Pay for a private driver or Join a tour group. With limited time, budget and of course off centre locations I was forced to my least favourite option… the tour group booked through my hotel ($20). Fortunately it did turn out well. One of the perks of staying in hotels is you rarely get bunched in with backpackers so today’s tour was instead with two sweet old Malaysian ladies…. who love food. I couldn’t have picked better. One retired, one semi-retired, both from an area of my interest in East Malaysia, both of Chinese descent, the younger a food fiend and the older sporting a broken arm. We bussed off to be tourists for the day. The first stop on the Vientiane City Tour isn’t far from where we start. We park on the street opposite the President Palace at the Avenue Lane Xang intersection. On one side sits Ho Phra Kaew Temple and directly opposite Wat Sisaket Temple. I poke round both temples reading signs and snapping pictures of Buddhist shrines and statues. Ho Phra Kaew turns out to be a former home to the famous Emerald Buddha which now resides in Bangkok’s Grand Palace (Wat Phra Kaew). At Sisaket Temple I find many Buddha statues spoilt with treats, many holding balls of sticky rice, apples, leaf wrapped rice buns, chocolate bars, Kinder Buenos… Even the statues with amputated arms balance treats on feet or stumps. Trees and stones at this temple were even being fed. Obviously something was going on so knowing this I follow the local monks to find local celebrations in the surrounding buildings. While exploring nearby buildings I stumble onto a ‘New Moon’ feast and am happily welcomed to join and eat with locals. Knees crossed I share soups, noodles and fiery dips with happy Lao folk. I felt at home. Worrying I would hold back the tour group I sneak out and bring them to join us. When we leave the locals pack together a small feast for our city tour – a plantain banana, 2 apples, sticky rice wrapped in pandan leaf and 2 Lactasoy soy milk drinks, chocolate flavoured and classic original. During the morning hours temple monks had circled the local area for Bintabat collection accepting offerings in their alms bowls. The offerings are then shared with the local community and in this case visitors. If monks did not share with outside the temple you would find a whole lot of podgy monks. Next on the Vientiane is Wat Si Muang a more lively and bustling temple compared to the previous. Almost a market atmosphere – hawkers ply their trade on temple grounds and streams of locals push between sacred Buddhas and the surrounding houses. Many are blessed by monks and I watch as a girl receives a Sai Sin bracelet (sacred thread) and blessing in a ceremony for good luck and fortune. From the creative mind of Thai sculpture artist Bunleua Sulilat – Buddha Park seems less of a religious shrine than a bizarre Narnian fantasy. A multi faced Buddha octopus, a man pulls legs from giant grasshoppers, a pigman riding the back of a human, Phra Rahou eating the moon. For best views of the park enter the mouth and climb three stories of the giant pumpkin. 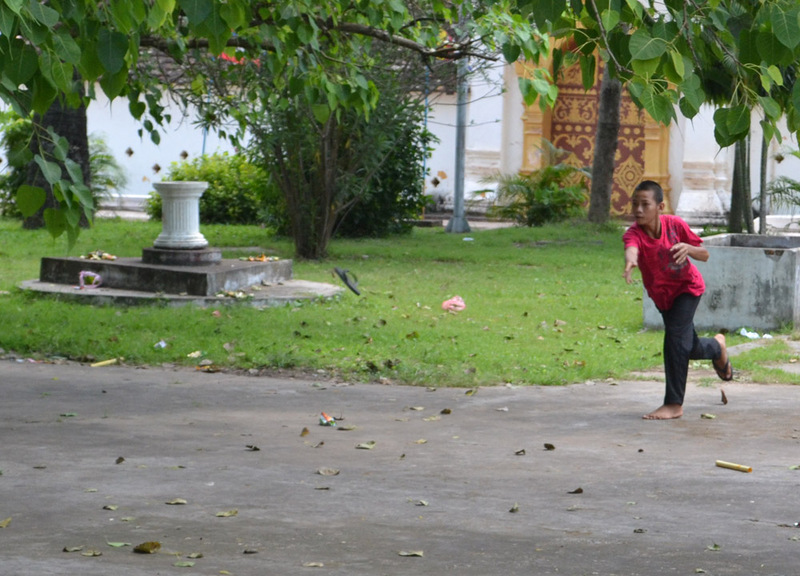 The park is found on the banks of the Mekhong River 20km from Vientiane City centre. It is the only attraction we visit outside of the Vientiane city tour and was the main reason for me joining the tour. It was well worth it. Something I forced from my thoughts until now. On the scenic drive back to Vientiane from Buddha Park we pass what looked to have been a deadly motorbike crash alongside the Mekong River. It looked like two young teens. No movement and noone yet at the scene. Definitely blood. We passed fast so I couldn’t see if one or two bikes were involved and think the one bike may have broken in two? It definitely involved a roadside pillar which sat central to the devastation. Not a peep from the driver or the two Malaysian ladies who I don’t think even noticed and I wasn’t ready to tap a shoulder and ask “did you see that?” Maybe they chose to ignore it and it was now left to haunt me. Back in the city centre the next attractions are all found on the Avenue Lane Xang. Having been to Patuxay on day one and having zero interest in shopping I opted out. With luck the Malaysian ladies had visited the morning market previously and we could pass by. I did take a quick walk again at Patuxay Monument where I find a new area called Patuxay Park with a vibrant local scene, outside seating, cheap eats and traditional Lao music blaring from park speakers. Having skipped past the market we arrive just after noon to Pha That Luang to find staff at the Stupa having nipped off for lunch. The iconic Gold Stupa of Wat Luang would be closed until 12.30. Not a big problem. Living in Southeast Asia I see temples everyday and not being Buddhist means coming face on with another Wat, shrine or stupa isn’t a big deal to me. My interest is more in local life surrounding temples so I go explore. After a snack of chicken and sticky rice from the area’s street food and losing a game of ‘Saw Bana’ with a bunch of local kids the temple opens and I do a quick round of the perimeter. 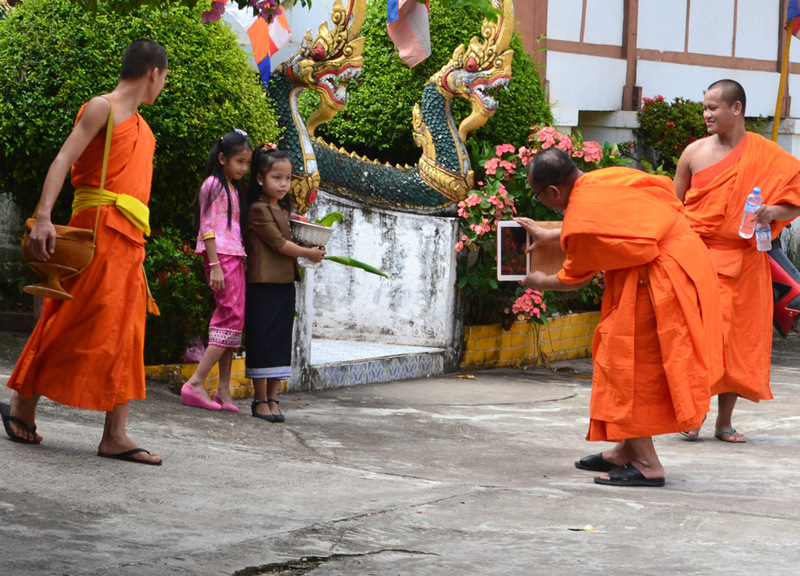 Wads of 500’s are anchored by slices of apple which kids had pilfered from the feet of surrounding Buddha statues. The kids step back then launch their shoes across the gravel. The closest shoe to the pile of money wins. A simple game with similarities to the French Petanque. Asking the kids tell teach me the game they called something like “Saw Bana”. No idea really. They invite me to play which I reluctantly do after finding my buy-in was a lot more than the rest (still tiny money). I also find my chunky size 9 Adidas are harder to guide than the precision of the kids flip-flop sandals. I walked away with lighter pockets, a scuffed shoe and slight humiliation. When I leave the kids place back the apple slices and offer the money to temple alms bowls (minus my chunk). This was the last stop of the Vientiane City tour. It wasn’t on the itinerary but being reluctant on an early return to the hotel I join the Malaysian ladies to be dropped off at Thong Khan Kham wet market. The ladies were looking for avocados…. weird? They also ask me along to eat Chinese Hot Pot with them but I had my own plans of drinking Lao-Lao that evening. I poke around the market, navigate surrounding streets, get lost and tuk-tuk back to the hotel. As far as tours go Vientiane City tour was one of the better I’ve come across.